Star Wars: The Force Unleashed Commemorative Collection Darth Vader With.... Condition is New. Shipped with USPS Priority Mail. Packaging has some slight shelf wear, however figures are mint and have never been handled. Package has been stored in a smoke free environment. Figures include Darth Vader with Lightsaber and fabric cape, and 2 Incinerator Troopers (Shock Troopers) each with a Blaster. Star Wars 40th Anniversary Black Series Darth Vader 6in Legacy Pack. Condition New Sealed unopened. Darth Vader Power of the Force Flashback Series 1998 Loose.Item is new. Item has never been displayed or played with. Item is still in the bubble. Card top has been cut off. Bubble will be mailed to you in an envelope for cheaper shipping so the bubble may come dented. Payment is to be by credit card on EBAY using EBAY MANAGED PAYMENTS. Shipping is $3.30 for 1 figure, for 2 figs=$3.60, 3 = $ 3.90, 4 = $4.20, Shipping for 5. or more figures is based on package weight, package dimensions, the shipping address, USPS First Class Package for packages under 1 pound and Parcel Select for package over a pound and a 30 cent handling fee per invoice. Each figure weighs about 2 ounces. A box for packages over a pound weighs about 8 ounces. Star Wars Darth Vader Action Figure - 31 Inches Tall - Jakks Pacific USED. Condition is Used. Shipped with USPS Parcel Select Ground. Sealed and brand new. Darth Vader Emperor’s Wrath Black Series Action Figure. Pristeen Condition.Missing light saber, but other than that this piece is in like new condition. G.M.F.G.I. 1977, Hong Kong. Unopened Darth Vader action figure in excellent condition. 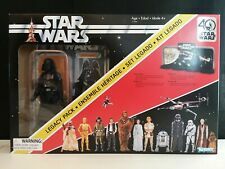 New ListingSTAR WARS 40TH ANNIVERSARY 6 INCH ACTION FIGURE LEGACY PACK - DARTH VADER! (x1) Star Wars 40th Anniversary - DARTH VADER! Your child can move Darth Vader’s arms, legs, and head to position him during his most intense battles. Star Wars Concept Darth Vader Ralph McQuarrie 3.75" Action Figure W/ Coin #28. Condition is New. Shipped with USPS Priority Mail. Unable to watch his son Luke Skywalker die at the hands of the Emperor, Darth Vader received a lethal blast of Force lightning as he hurled his master to his doom. Imagine new adventures with 2 included accessories. I am selling some of my S.H. Figuarts collection in order to save up for some Hot Toys figures. Item is loose and complete, and in perfect condition. Item was never displayed, and was stored in an acid-free blister. So, condition is used since it is opened. Original packaging not included. Shipped with USPS Priority Mail, in a bubble-wrap envelope. This is not a knock-off. I purchased this figure from CDJapan and had it shipped to me from Japan. PayPal only. STAR WARS FORCE LINK 2.0 - DARTH VADER (loose). Darth Vader * Power of the Force 1997 Loose. Item is new. Item has never been displayed or played with. Item is still in the bubble. Card top has been cut off. Bubble will be mailed to you in an envelope for cheaper shipping so the bubble may come dented.Payment is to be by credit card on EBAY using EBAY MANAGED PAYMENTS. Shipping is $3.30 for 1 figure, for 2 figs=$3.60, 3 = $ 3.90, 4 = $4.20, Shipping for 5. or more figures is based on package weight, package dimensions, the shipping address, USPS First Class Package for packages under 1 pound and Parcel Select for package over a pound and a 30 cent handling fee per invoice. Each figure weighs about 2 ounces. A box for packages over a pound weighs about 8 ounces. Listing is for a Star Wars The Black Series Darth Vader 6" Action Figure. Item is in good used condition. See photos for more accurate description of detail. Item is as is. NO RETURNS ACCEPTED. If you have any questions please contact us before buying. Thanks for looking! Free shipping! Good used condition, shows little wear. Legs, arms, and light saber move fine. A good number are complete. Boba Fett is complete. I use the Imperial Gunnery to verify my weapons. It is done by weight. If not paid by then the case will be closed, and the item will be relisted. All original new but box does a have dent in it. Star Wars Action Figure Darth Vader The Black Series. Condition is New box has scuffs and a few creases but unopened. Shipped with USPS First Class Package. NOTINCLUDED, PICTURED TO SHOW WHAT SABER LOOKS LIKE IN VADER'S HAND. THESE HANDMADE SABERS LOOK GREAT WHEN IN VADER'S HAND. #3 PUT VADER'S SABER HAND INTO THE WATER FOR 30 SECONDS. Thrift store find. Darth Vader Star Wars black plastic carrying case for figures collection. Made in 1980 by Kenner Products, Cincinnati, Ohio. Case only; no figures. I don’t know much about Star Wars collectibles, but the case seems to be in pretty good shape, and all latches are there and working properly. About 16 inches across. Scratches and scuffs, but clean. Several character names are labeled inside. Please see pictures for details and condition, and let me know if you have any questions. I’m starting it cheap because I don’t know anything about this stuff. Shipped with USPS Priority Mail, Continental United States only. Thank you! Slight shelf wear may be present. Sold as is. Item pictured is item sent. Star Wars The Black Series Centerpiece Darth Vader on Tantive IV base, inspired by Star Wars: A New Hope. Give us a shot and we will make sure that you will look to us again! Item model number: C1554. Trending at $24.60eBay determines this price through a machine learned model of the product's sale prices within the last 90 days. Your child can move Darth Vader’s arms, legs, and head to position him during his most intense battles. See photos of the item you will be receiving, this includes card and bubble condition as I am not a grader. 100% Original Light Saber. Light Saber has been checked utilizing float test and light test and is 100% authentic. 100% Original cape. Joints are Tight; See pictures for condition. From The Black Series. -Movie accurate assembly and ventilation sounds effects. With exquisite features and decoration, this series embodies the quality and realism that Star Wars devotees love. Imagine the action and suspense of Star Wars: A New Hope with the Star Wars The Black Series Centerpiece Darth Vader. Hasbro Star Wars The Black Series Darth Vader Figure Action Figure. Condition is Used. Shipped with USPS First Class Package. NOTINCLUDED, PICTURED TO SHOW WHAT THE SABER LOOKS LIKE IN VADER'S HAND. THESE HANDMADE SABERS LOOK GREAT WHEN IN VADER'S HAND. #3 PUT VADER'S SABER HAND INTO THE WATER FOR 30 SECONDS. Star Wars Power Of The Force - Darth Vader Short Saber Green Card - Kenner 1997. Condition is New. Shipped with USPS First Class Package. Darth Vader with Interrogation Droid Power of the Force Commtech Series Loose. Item is new. Item has never been displayed or played with. Item is still in the bubble. Card top has been cut off. Bubble will be mailed to you in an envelope for cheaper shipping so the bubble may come dented. Payment is to be by credit card on EBAY using EBAY MANAGED PAYMENTS. Shipping is $3.30 for 1 figure, for 2 figs=$3.60, 3 = $ 3.90, 4 = $4.20, Shipping for 5. or more figures is based on package weight, package dimensions, the shipping address, USPS First Class Package for packages under 1 pound and Parcel Select for package over a pound and a 30 cent handling fee per invoice. Each figure weighs about 2 ounces. A box for packages over a pound weighs about 8 ounces. Item shown in picture is the exact item you will receive. Star Wars Vintage Collection VC 08 Darth Vader. Condition is Used. Shipped with USPS First Class Package. Lose complete. Includes two part helmet and lightsaber. This is the first version of the figure. Will combine shipping and accept offers. It's in near mint condition, tiny small tears in arm holes. Everything is original. No reproductions. Minimal paint wear. Vintage STAR WARS ROTJ Darth Vader Lightsaber Weapon Original Figure Accessory. Lightsaber is in mint condition. I believe this was released with the 1980 ESB or 1983 ROTJ. Tip is attached! Condition is Used, but in good condition. 100% Original! Shipped with USPS First Class Package. We combine shipping! Hasbro Star Wars Rogue One Darth Vader Action Figure New. Condition is New. Will combine shipping Shipped with USPS First Class. Star Wars Battle Damaged Darth Vader 30th Anniversary Force Unleashed 2007. Both in excellent condition, see the pics.